In addition to health and pension benefits and a variety of member help programs, the UFT and its affiliates offer UFT members a variety of discounts and promotions through various programs. These range from serious matters like long-term care insurance to lighter things like movie tickets. The UFT’s Recreational Activities Department runs a beloved program called “Just for Fun” – which is pretty much what it sounds like, discounts and group trips that help restore the soul and ease the mind through fun activities. 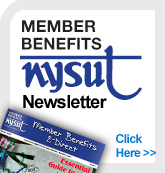 Our state affiliate, the New York State United Teachers, offers a broad range of discounted services, including insurance benefits, financial and legal services, and store discounts. The AFT offers benefits, discounts and promotions to its members with its AFT+ Member Benefits Program. These benefits can only be accessed by visiting the AFT+ Member Benefits page and logging in with your UFT/NYSUT member ID. The UFT Just for Fun department offers many quality items that are practical to own and make great gifts. Plus, they all bear the UFT logo, which lets you show your union solidarity while looking stylish. UFT members who live in New York State and are interested in cutting their electric bill while also helping the environment can participate in a UFT Member Benefits-endorsed solar program. American Solar Partners offers a free solar assessment to show homeowners how they can potentially save thousands of dollars on electricity through owning a solar system. Check out the New York Times article, Is New York Ready for Solar Power? Mortgage Discounts — Many lenders love to market special discounts to UFT members. Shop around and find an offer that is right for you.